It’s that time of year again, when that chill in the air brings out warm feelings in everyone. Yes, we’re talking about the holidays, one of the most joyous times, thanks to friends, family, and holiday traditions. Last year, The Roof Authority made a blog about hanging Christmas lights on your house (Tips For Hanging Christmas Lights This Holiday Season). This year, we’ll give you even more tips on how to create the best outdoor holiday lights display. You’ll get great ideas on how to hang your lights, what to do before you start hanging your Christmas lights, and even the best tools and objects to use to help you get lights on those hard-to-reach areas. 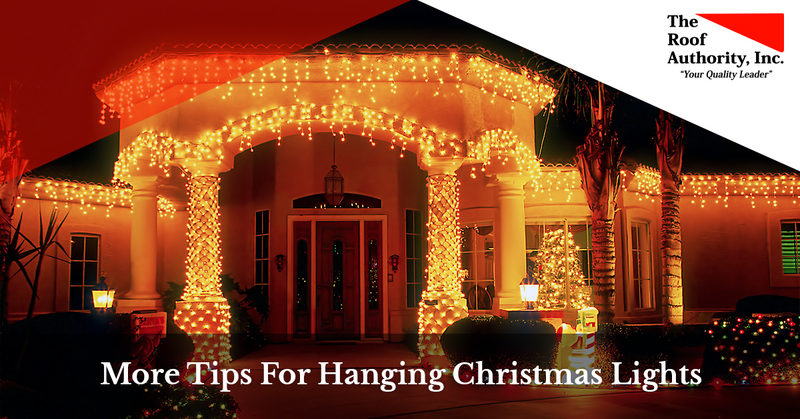 Keep reading to get some ideas on how to hang your holiday lights this year. One of the worst things to happen to you when hanging your lights is have them not work after you’ve already set them up. So, before you set any lights out on the lawn or up on the roof, make sure they all work. Plug them in and set aside any that don’t work or don’t fully light. For the lights that don’t work, try replacing bulbs or fuses to see if that’s the problem. If that doesn’t work, then it’s time to get some new Christmas lights and recycle the old ones. Be sure to check the gutter and shingle integrity on your roof as well if you plan on hanging lights on top of your house. Also, be sure to check any and all extension cords, power strips, and surge protectors before you start plugging things into them. First of all, make sure that they can be used outside. Then, check for any cuts, breaks, or possible exposed wiring to make sure there isn’t a chance of anything exploding or lighting on fire when you plug everything in. Finally, make sure that everything works properly before using any extenders or extra cords in your holiday lights display. It may be a little time consuming at first, but this will definitely help you in the long run. If you do need new lights because some aren’t working, or you just want some awesome, new Christmas lights, then it’s time to take a trip to your local hardware store or supercenter. Updating your lights also has great benefits, as you can create new displays that are more vibrant and cost effective. LED lights are bright and beautiful and will help create breathtaking light displays for all to enjoy. They come in numerous varieties, such as multi-colored, wide-angle mini lights, and even plain, white lights. They’ll also help save you money as LEDs need a lot less electricity to operate than traditional light bulbs. Rather than simply throwing some lights up here and there, hang your Christmas lights in strategic places. The roof is a great place to start hanging your holiday light display. Many hardware stores and supercenters will have plastic clips you can use to secure your holiday light strands to your roof or gutter. Banisters or pillars are an easy place to put lights on; simply wrap your lights around them in a descending spiral pattern, and voilà! You can also put lights on outdoor trees and bushes, with some lights being specifically made for outdoor fauna use. Hanging holiday lights and having them stay put or last all season can sometimes be one of the hardest parts of the holidays. However, having the right tools to help in your endeavor will make the process so much easier. Be sure to have the bare necessities: outdoor extensions cords, outdoor surge protectors, light clips, stakes, and any tools you might need, like a hammer, drill, tape measure, or level. Make sure these tools are readily available to you everywhere you go, or that there’s someone helping you that can hand you and keep track of the all the tools you need. If you’re hanging things on your roof, then a ladder is a must have. If you’ve had trouble hanging lights on tall trees, then an extender with a claw or hook you can use to move the light strand will make things infinitely easier for you. Using fasteners and wire is an easy way to attach rope lights to outdoor fixtures. Wreath hooks make hanging wreaths from just about anywhere a breeze. Everyone here at The Roof Authority hopes you found this blog helpful. If you’re looking for the best residential roofer in the Vero Beach area, then The Roof Authority is ready to help you. Learn more about The Roof Authority, see what roofing services we can offer for you, or contact us today to get a free quote.